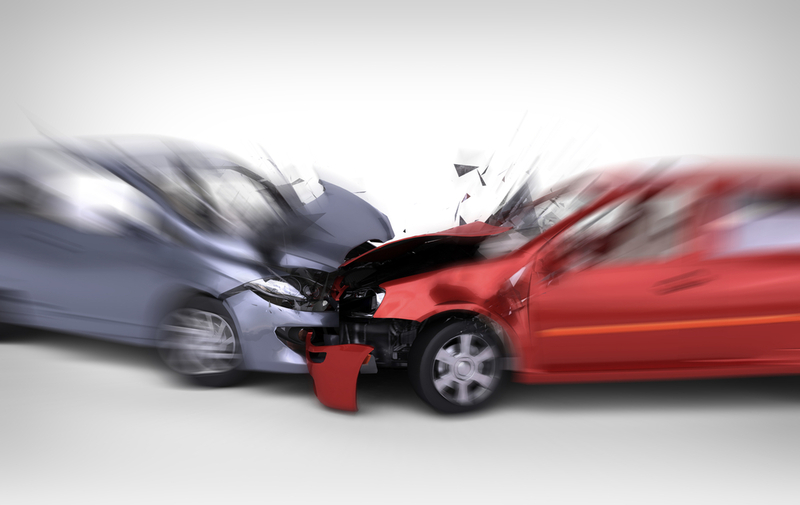 Last semester I took a risk with by getting “creative” with an assignment technology-wise and… failed. 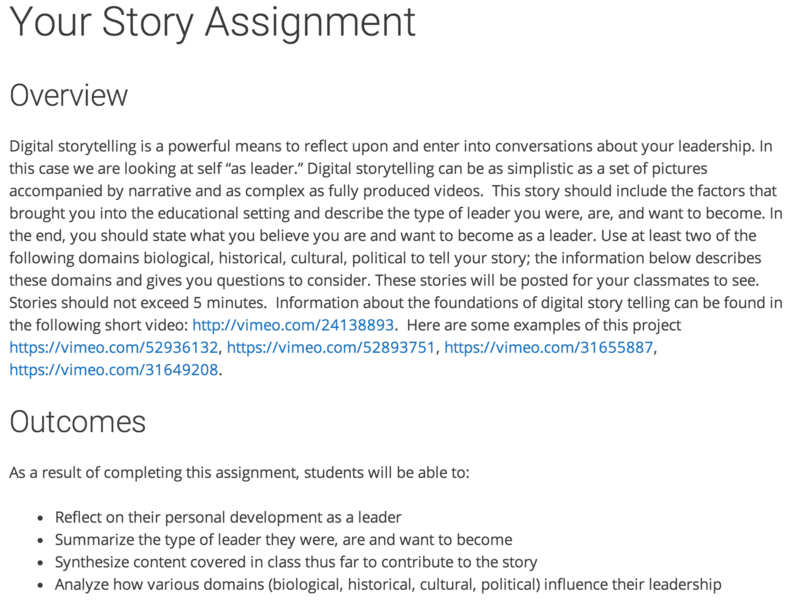 In my Liberal Studies Capstone Course, I assigned students what I thought was a clearly structured, outcomes-based assignment that would require them to articulate their personal philosophy on leadership in a well-crafted digital story. I found a great resource on the web that helped me come up with the instructions that I thought were necessary to set students up for success. I provided an overview of the assignment, the outcomes, a resource for getting help with video making and who to submit the assignment. 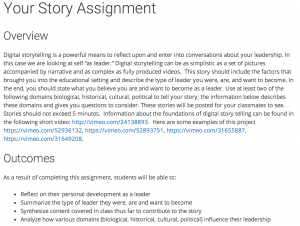 Each week until the assignment was due, we completed activities that required the students to think about their leadership – building them up to articulate their leadership story. I waited anxiously to see what the students would create. The night before the assignment was due, the students were frantic because they could not figure out how to get the technology to do what they wanted it to do. Yet again, I referred the students to the resources (lynda.com) for making videos but their frustration with technology seemed to create a mental roadblock that I could not get them to surpass. 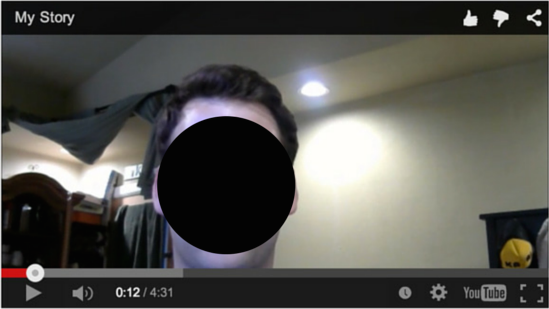 I gave the students an extension but the final products were much different than what I (or they) had expected: most students submitted a stale video of themselves sitting in front of the camera looking like a talking head. For the most part, I think they did the best they could with where they were at, and I did too. We all learned through the experience even though it did not go as I had envisioned. Yes… scaffolding i s the stuff you see on the outside of buildings that provides temporary support for workers to build. The idea of scaffolding is that students engage in a learning process that includes a series of activities with instructor feedback provided each step of the way. This allows the students to master one level before moving to the next. Rebecca Alber (2014) describes this process as dividing up learning into “chunks” and then providing some support with each chunk. Makes sense, right? So, what was my mistake? I did apply the concept of scaffolding to build students up to being able to analyze their leadership story. But, I DID NOT use the same process to get them to the point they needed to be to use the technology required to deliver a “digital story.” In fact, I pretty much did the opposite of that. Just as much as we can’t expect a student to whip out a 20 page research paper with little preparation and guidance without lower-stakes assignments along the way, we can’t expect a student to create a video using images, video and voice (and maybe even music!) without support along the way. I’m doing this assignment again this semester (I know, I am crazy) but, I am structuring the process much differently. I will have students use their webcam to leave a video comment (in a VoiceThread conversation); create their now, simple “talking head” video; create a video that includes text; and a video that includes images. All of these “chunks” of learning represent lower stakes assignments in my class and provide students with an opportunity to build on their skills each step of the way. I’ll also be asking students to submit and revise a script to build up their confidence with the content of their digital story. How do you know if you need to use scaffolding in your assignments? 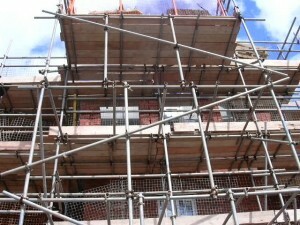 According to Caruana (2012), “A good rule of thumb is the higher the stakes, the more scaffolding you need to include. In other words, the heavier the weight, the stronger the support.” Just as much as we would not expect a construction worker to start repairing the tenth floor of a building without scaffolding, we shouldn’t expect our students to either. But, that doesn’t mean we shouldn’t take risks to push students’ learning (and ours)… WE just have to be willing to self-assess and adjust… and remember… there’s always next semester.